The chairman of a £50m fund-raising appeal to save Canterbury Cathedral from crumbling away is standing down because of a heart condition. 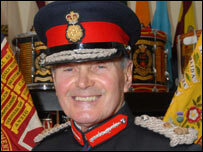 Allan Willett, 70, said he had been told by doctors to reduce his workload so that he can continue in his post as Lord Lieutenant of Kent. "Although the heart problems are not life-threatening they affect my energy levels," he said. The fund-raising campaign, begun in October, has raised more than £6m. Mr Willett said at the launch the picture postcard image of the cathedral masked a "very different reality". Deteriorating stonework and a leaking roof meant parts of the structure might have to be closed to the public unless the cash was raised for repairs. Businessman Mr Willett set up the global fund-raising campaign, and his own charitable foundation has given £500,000. "Allan has been a tremendous supporter of Canterbury Cathedral for many years and has led from the front with the initial stages of our fund-raising campaign," said Dean of Canterbury, the Very Rev Robert Willis. "We are all very grateful to him for his enthusiastic and dynamic leadership. "We hope that he soon recovers." Mr Willett is being treated for atrial fibrillation, which affects the regularity of his heartbeat. He is to remain as a trustee of the Cathedral Trust Fund and continue to chair meetings until a new chairman is appointed by the Dean and Chapter and trustees.